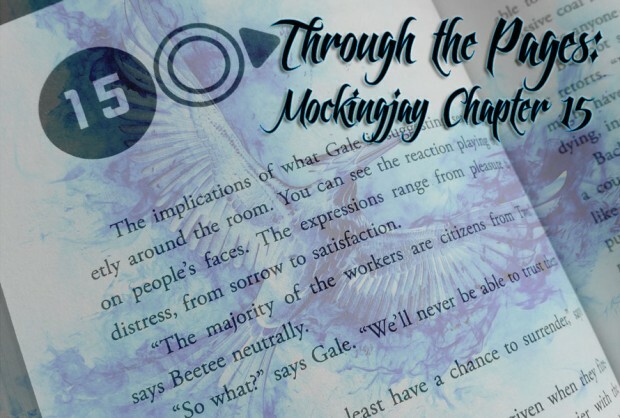 The chapter starts with the aftermath of Gale’s suggestion to kill everyone inside the Nut. Lyme disagrees with him, and Katniss tries to convince him that doing so would be reaching President Snow’s level of cruelty, that most of those people are probably innocent and working there under coercion. Boggs reminds them there’s still the option of flushing them out and capturing them instead of outright killing them. They decide to confer with President Coin and she will have the last say as to which option they will go with. Katniss suits up and they get into position on the roof of the Justice Building, while the D13 hovercrafts drop bombs on the Nut, Gale’s plan of causing avalanches to block the exits going off without a hitch. As she watches, Katniss flashes back to the day her father died in a mine cave-in, feeling guilty for putting these District 2 people through the same terror. They get the order to retreat in case the Capitol retaliates, and as they wait by the entrance, Boggs tells Katniss they didn’t bomb the train tunnel; that means some people can still get out. The survivors will have to escape toward the Town Square, where the rebel soldiers will be waiting to take them prisoner. Katniss hopes it doesn’t devolve into a gunfight where all the survivors die anyway. As she waits, Haymitch contacts her through her earphone and tells her there’s been a development with Peeta: he recognized “The Hanging Tree” as the song Katniss was singing in her propo. He said he remembered it from one time Katniss’ father came into the bakery singing that song. Katniss muses on how much her father has been popping up that day, and how much she misses him. The shooting continues; Gale rushes off to join the fight, but Katniss stays behind, not sharing the eagerness to kill their enemies. After midnight, Cressida informs her they want her to make a speech: they hope if they broadcast her live, it might stop the fighting. The moment she starts speaking, two trains come out of the Nut, full of injured armed people. One man in particular targets Katniss, asking why he shouldn’t shoot her right then and there. She responds that he should if he really wants to, because she’s done killing the Capitol’s slaves. When the man responds he’s not a slave, Katniss tells him she is; everyone in the districts is. That’s why the cycle of killing goes around, but no one actually wins except the Capitol. But she doesn’t want to be a piece in their games anymore. They have no quarrel with District 2 except the one the Capitol created. 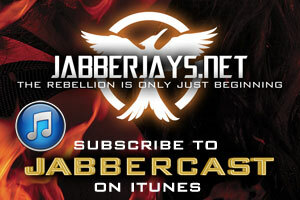 The rebels are not the enemy– the Capitol is. And that’s why District 2 needs to join in the fight against them. For a moment she thinks she’s gotten through to them, and then she sees herself get shot on the TV screens. I’m guessing that this scene will be a major action scene in the film–like how breaking into the vault at Gringotts during Deathly Hallows: Part 2 got us into the action right away. The destruction of the Nut has always kind of confused me while reading the scene, so I am excited to see it play out on screen. I have a feeling that Katniss won’t get shot like she does in this chapter, especially if they want her to be badly injured during the bombing at the President’s mansion later on in the film (remember her skin was basically burnt off and she had to get skin grafts?). I also think that it will pause the momentum of the film if they keep it, because the bullet never goes through her anyway. The force of it just kind of shocks her. Of course, I do hope that they keep it, obviously. This chapter is also when Katniss realizes how bloodthirsty Gale can really be, and I truly hope that this makes it into the film. Gale has always been a difficult character for fans of the books and film audiences to connect with or understand, so I think it is crucial that they nail this aspect of his character because it is essentially what drives him and Katniss apart. I’m also hoping that District 2 is fleshed out a bit. I would really like to see around the whole district and how the civilians act while everything is going on. If anything, I think this chapter in the book promises to be an awesome spectacle on screen. This is such a linchpin moment for Gale and for his future relationship with Katniss. The things he has talked and raged about while hunting with Katniss in District 12 are now being put in to action. Everything he has experienced from the hands of the Capitol have created such burning hatred that he is more than willing to sacrifice those within the Nut with little regret. He wouldn’t be the first young man in history to jump to war with sorrow and revenge in his heart. It’s a very important moment for the character. ‘Here put into practice, they become deeds that can never be reversed.’ I hope we get to see Gale make this choice and more importantly to see the conflict within Katniss of such a choice to make. It’s a turning point for her and makes her question her own philosophy on war. I’ve always seen this moment as a parting between Gale and Katniss because fundamentally, over the course of her experiences, her views on Panem society align more with Peeta than with Gale. I hope the film shows the weight of such a decision and no doubt Francis Lawrence will present a visceral collapse of the Nut that will be an emotional depiction of the cost of war. I’d love to see or hear reference made to the death of her father, perhaps with a discussion with Boggs. But instinct tells me we’ll go straight from The Nut to the Square outside the train station. I’m guessing the discussion between Haymitch and Katniss about Peeta listening to ‘The Hanging Tree’ without having a fit may come at a later time. I have faith that most of what takes place in the Square will be lifted from the book. I hope Haymitch is talking to her via an earpiece but seeing as though we saw little of this in Mockingjay Part 1 it’s difficult to say. But I’d imagine most of Katniss’ dialogue to the man pointing the gun at her will be verbatim and Jennifer Lawrence will knock it out of the park with heroic gusto. I can only hope the shooting is as shocking as the first time I read it. Chapter 15 presents interesting turning points for the conclusion of the trilogy. It is arguably the biggest offensive by the rebels to date following several skirmishes and ongoing stalemates (although Hollywood sped that up in Part 1! ), which sets up the final assault on the Capitol. And it is also where Katniss really starts to lose the ‘boy with the snare’, as she starts to question both her role in the conflict and the futility of war. Throughout the films to date, and with the action scenes in Mockingjay: Part 1, we have seen glimpses of Gale’s simmering rage – which all has to boil over! The deleted scenes of Part 1 included the exchange between Gale, Beetee and Katniss in the garden inside District 13, and although it didn’t make it I’m sure they will leave his plans for the Nut pretty intact. As for the Nut, although this sounds somewhat sadistic I am looking forward to seeing its destruction play out on screen, especially following the epic demolition of the dam in District 5 in Mockingjay: Part 1. I’m also looking forward to Gwendoline Christie’s portrayal of Commander Lyme during these scenes, especially when it comes to Gale’s comment about how cozy to the Capitol they must be. Once it does blow, as Ciara mentioned, its impact is going to resonate far beyond the physical. I’m going to give an early shout out to Ve Neill and all of the make-up team involved too, because I’m sure the wounded victims will be confronting, as they should be. Lastly, there’s the confrontation in the square and Katniss’ epic speech. I’m wondering if there may be more of a firefight on screen than there is in the book before Katniss speaks, and we all know Jennifer Lawrence is going to be amazing here. Aside from the massive shock when she was shot, it was also one of many shocks for me as to just how much this girl goes through and she keeps getting up. I hope that this is intact in the film, as I found the physical trauma (let alone the emotional trauma!) Katniss endures and her courage and willpower to continue on incredibly inspiring. This is such a terrific episode, such a game-changer, it’d be a shame if most of it wasn’t included in the movie. Coming from the previous chapter, the fallout of Gale’s suggestion has to be included for sure (I especially look forward to seeing Gale and Lyme have it out, I get the feeling they’ll have her objecting more strongly in the book than she did in the movie), because it is a key moment signaling the first major crack in their friendship: showing how, even though they’ve been through a lot of the same experiences and can relate to each other’s suffering so well, the way they view those experiences is fundamentally different. We probably won’t see a lot of Katniss linking this event to her father– perhaps a line or two thrown in during the argument with Gale, but because most of her ruminations about it were introspective, it probably won’t be made explicit. I definitely hope we see Katniss’ expression as she watches the bombing happen, though; as I’ve said in the past, one of my favorite things about having Jennifer Lawrence as our lead actress is that she can say so much with her expression, even without any dialogue. This would be one of the scenes I’d be more eager to see: just a shot of her troubled expression as she watches the destruction the rebellion is bringing to District 2. The entire Nut scene is so cinematic, it’s hard to imagine it not being included in the movie, and indeed I think it will be a fairly lengthy sequence, taking up a lot of time from the movie. I believe it will start as a wide shot of the mountain being bombed, where we can see the avalanches coming down and blocking most of the exits and vents. Then as people start coming out through the train tunnel and are met with the rebel fighters, it will devolve into a more traditional war gunfight scene. I hope they show the injured survivors just as much as they do the fighters, though, as I think it’s very important to reinforce the fact that there were many innocent people working in the Nut. I don’t think they’ll wait long to have Katniss go in; we won’t get to see hours pass, but rather they’ll probably have her ready for her speech relatively soon after the fighting starts. I think her speech will be very, very close to what it was in the book– perhaps a smidge shorter, but the same in essence– and the reaction from the District 2 man will be similar. It’s too good, too impactful, to change it in any major way. Because there’s been so little focus on Katniss’ father and his singing anyway, I don’t believe Haymitch’s news about Peeta’s improvement will be included. They might tweak it a little, but as most of this chapter will be one long action sequence, I think it would be detrimental to the pace to include it. If they do include some news about Peeta’s condition getting better in there, it’ll probably be right after the meeting at the beginning (and if Haymitch gives her the news right in front of Gale, that might make the tension between him and Katniss even more intense). That said, this is the chapter that really makes me hope they’ll actually have Haymitch in District 2, rather than him just communicating by radio. I feel like he needs to be there, because this chapter almost made it feel like he was there. So I really hope they’ve made that decision in the movie; it wouldn’t be a big change, but I think it would add a lot of weight to Katniss’ stance at the end of the chapter. This scene where Gale pitches the plan will be very important because knowing the ending, it has to be the start of showing Gale’s fire in a legitimate way. In MJ1 he was afraid (and rightfully so) when he went to the Capitol to rescue Peeta, so he’s gone from being mostly talk to having experience in the field and I feel like this helps give him the guts to even put this out there to people besides Katniss. 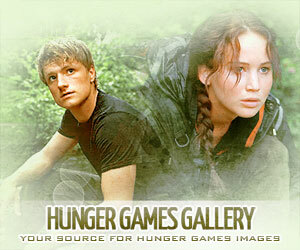 It propels Gale into the forefront of the war effort and begins to show the reasoning behind Katniss’ choice at the end. I think we’ll definitely see Katniss’ horror at the fall of the Nut, almost in a Scarlett O’Hara ‘Just like Pa’ kind of way, and I can’t wait to see how Jennifer performs it. I don’t think Haymitch will be in her earpiece; he’ll be there in Two. I say this because having him talk in her ear isn’t very dramatic and because we know that Woody was at the Tempelhof filming, so he was likely in District Two scenes. I agree with Carla in that the singing thing with Katniss’ dad won’t be included.